The snow has mostly melted. Grass is finally visible. Games are finally being played ... well, at least on the fields that have drained properly. So, it's a perfect time to list the top 20 story lines for the 2015 high school softball season. Hauppauge may have the best lineup in Suffolk, but there's a major shuffle underway in the field. First-team All-Long Island outfielder Catherine Vaughan moves to the circle. Lyndsay Smocer shifts from first base to behind the plate. Only the double-play combination of shortstop Kaitlyn Snyder and second baseman Jillian Choinski will remain in the same position as last season. They even have a new head coach. 2. The Return of Jim McGowan Sr.
For the past few seasons, the interfamily softball coaching matchup has been between Jim McGowan Jr. at Hauppauge against Jason McGowan at East Islip. 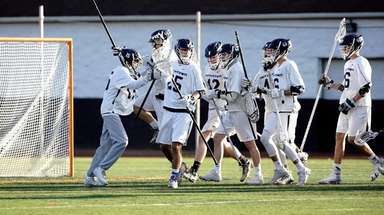 Legendary coach Jim McGowan Sr., who last season served as a volunteer coach under his son at Hauppauge, takes over as head coach for the Eagles. Jim Jr. is now the baseball coach at Eastport-South Manor. McGowan won 661 games as head coach at Bay Shore, the most in New York State history, and seven state championships. A Hauppauge vs. East Islip county final between McGowan and his son, Jason, isn't out of the question. Hauppauge has the Big Three of Vaughn, Snyder, and Smocer, and EI has one of the county's best young pitchers in Courtney Greene. Prediction: Darby Pandolfo, a junior catcher for Massapequa, will take home many trophies and plaques at the end-of-season Nassau softball dinner. (Sarah Cornell, Jenna Turato, and the McNamara's will certainly challenge her). As for the Suffolk dinner, Marissa Rizzi better bring a wheel barrow for her trophies. Pitching in Nassau Conference AA-I has come full circle. Gone are the familiar names of Kerri Shapiro, ToniMarie Valeriano, Ashley Massoni, etc. What this means is that the circle is open for many of the premier teams in Nassau. And what that means is the conference is wide open for many hungry teams. The most experienced and tested pitcher in AA-I is Nicole Imhof of Calhoun, which could be a sleeper team this season. Adding to the intrigue is the new conference alignments. In Nassau AA, rather than having four conferences of five teams, there are two conferences of 10. In AB, there are four conferences, with A-I consisting of 10 teams and the others consisting of nine. In ability based alignments, that likely means more lopsided games than last season. Some say this is a good thing, some say it's a bad thing. Either way, it will be interesting to see who makes a name for herself in the circle. It's not fun to be a pitcher in Suffolk League III. Nor is it fun to be a hitter. The deepest league in Suffolk is the home of pitchers such as Marissa Rizzi, Cassie Cancemi, Courtney Greene and others. Stepping to the plate are the Hauppauge Big Three, Breanna Kuhner of West Babylon, Amanda Catatano and Lindsay Ness of Centereach, Alexa Martone of EI, Jackie Chester of ESM, Alli Wiener of Deer Park, and Nicole Graber and Alyse McAlpine of the defending county champion Half Hollow Hills West Colts. Bracket prediction: Center Moriches, Babylon, Oyster Bay, Carle Place. Center Moriches, led by Erin Creen and Cierra Smith, has enough to get back to the state tournament. Babylon has plenty of young talent such as Gwen Donaldson, Molly Cummings and a formidable duo in the circle with Alyssa Sasuk and Allie Stanya. Defending Nassau champ, Oyster Bay, returns Dana Galgano and Emily Moore. Carle Place has a strong foundation in place with catcher Lydia Rice and pitcher Shannon McGuinness. After making the playoffs for the first time in over two decades, the North Babylon Bulldogs are no longer the underdogs. 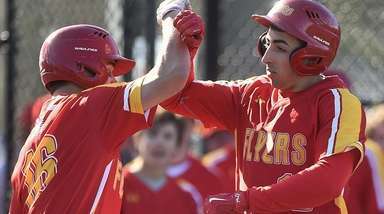 With nine seniors on the team this season in addition to one of Long Island's best young catchers in Nahtica Shepherd, North Babylon is in position to have one of the best seasons in program history. Gina Napoli -- called a "bulldog on the mound" by her coach. See what he did there? -- throws strikes consistently. Alexis Rutha is the anchor of the infield. Beware of the Bulldogs. West Islip, with Rachel Wandzilak in the circle, is still the team to beat in League II, though. Led by Jess Griffin, who covers as much ground as anyone in the outfield, and Olivia Kaczmarek, a brick wall behind the plate, they are the best Class A team in Suffolk again this season. If they win the county, they would have a tough game against Carey (who remains the favorite in Nassau A with Jenna Turato and Brianna Pinto), Island Trees, Clarke or whoever comes out of Nassau. But they certainly have what it takes to make a fourth consecutive trip to the Final Four in Glens Falls once again. 10. J-E-T-S ... Jets! Jets! Jets! The East Meadow Jets still are ranked second in Nassau AA despite losing major pieces from last season's state championship winning team. That includes Kerri Shapiro (the Long Island Player of the Year), Claire Travis (a first-team All-Long Island selection), and Madison West (their longtime catcher who advanced to at least the county final in every season of her career). They will have six new starters, but return key components like Crista San Antonio, Kristen Lindquist, and Jess Laird. The starting pitching spot remains up for grabs, according to East Meadow coach Stew Fritz. Every single starter from the county champions returns except Francesca Casalino. That includes a strong core of Nicole Graber, Alyse McAlpine, Alexandra Parkas, and Gabrielle Casalino. 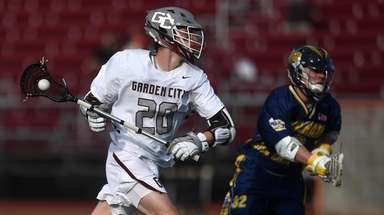 Replacing Casalino, the Suffolk Player of the Year who guided the team to its first county title in program history, is certainly a huge hole to fill. But junior pitcher Alexis Kleet is ready for the challenge. Kellenberg seeks a fourth straight CHSAA state championship. Last season, the Firebirds finished third in the league during the regular season and still managed to retain their state supremacy. Gone is the spark plug from all three championship teams, Krista King. But the Firebirds return Katherine Piorkowski, Alexa Russell, Amanda Riveira and Kelly Rasulo. St. Anthony's is strong, especially on the left side of the infield with Kim Puzo at third and Lexi Reale at short. Taylor Fay and Marissa DeLaurentis cover a lot of ground for St. John the Baptist. Sacred Heart has talented sophomore Janae Barracato. Holy Trinity features up-and-coming youngsters Kristen Collins and Tierney Fitzgerald. That's stiff competition. Can the Firebirds extend their dynasty? Last season, Sarah McKeveny of Connetquot and Sam Van Dorn of Patchogue-Medford shared Pitcher of the Year honors in League I. Their follow-up seasons will be fun to watch. Especially in a competitive league that boasts Leah Mele and Longwood, Alyssa Persich and Commack, Jayna Rios and Floyd, Kirsten Bello and Sachem North, and Marissa Wilson and Sachem East. 14. How many home runs will Marissa Wilson hit this season? She led the county with eight last season. She may reach double digits this season. She may take Sachem East back to the county final, as well. Can anyone dethrone Carey? 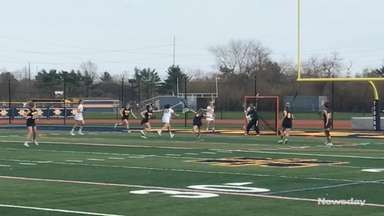 Jenna Turato's command is too good, Brianna Pinto may be the fastest player in Long Island, Rebecca Vilchez, Amanda Ulzheimer, and Ruth Rodriguez bring power, and the defense is solid all around. But doubting Island Trees has been a mistake in the past. Ashley Melendez, a returning All-Long Island selection, is the centerpiece. She leads a strong senior core that includes Christie Ciaramitaro, Morgan Petry, Sam Scharff, and Kelly Cembrale. This conference features more returning All-Long Island players than any other, including Turato, Melendez, Division's Alexis Alvino and Seaford's Sophie Dandola. Oh, that's right, Sarah Cornell. How will she top a season in which she made first-team All-Long Island as a sophomore, struck out 20 batters in a game, and tossed multiple no-hitters? Not sure, but it will be fun to find out. Well, not for batters. Riley Anderson from Floral Park; Kacie Badolato from Kellenberg; Angela Barberis from Harborfields; Emily Bartoletta from Plainview JFK; Jackie Brown from Port Jefferson; Mallory Donelan from Mineola; Laura Galligan from Whitman; Alex Hulse from Mercy; Kate Kozuch from Roslyn; Taylor Larson from Islip; Jess Laird from East Meadow; Brittany Lazar from Seaford; Joanna Marmo from Calhoun; Lindsey Ness from Centereach; Sabrina Odierno from Cold Spring Harbor; Sam Palazzolo from Wheatley; Megan Ricci from Center Moriches; Lexi Rosko from Southampton; Selena Ruiz from Clarke; Lauren Ramos from Westhampton; Alyssa Schwalb from Lindenhurst; Lia Stamile from South Side; Rachel Voegal from Mattituck; Lauren Williams from Sacred Heart. Here are 23 pitchers to keep an eye on this season. Pretty sure a few of the players listed below will be hoisting some championship plaques at the end of the season. Marrisa Rizzi, Eastport-South Manor, Jr. -- Arguably the best pitcher and player in Suffolk. Nicole Imhof, Calhoun, Sr. -- Three-time all-county lefty with a nice combination of pitches. Tonianne Larson, Long Beach, Soph. -- Young power pitcher has a two-seam fastball with some bite. Cassie Cancemi, Kings Park, Soph. 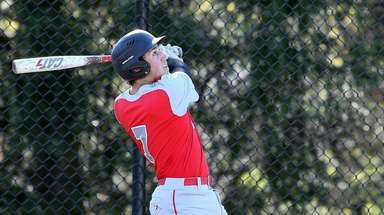 -- Power pitcher has led Kings Park to playoffs last three seasons. Samantha Van Dorn, Patchogue-Medford, Sr. -- The reigning League I co-Pitcher of the Year. Sarah McKeveny, Connetquot, Soph. -- The reigning League I co-Pitcher of the Year. Justine Jean, Division, Jr. -- Throws very hard and has plenty of movement. Emily Skupp, Mineola, Jr. -- Throws for strikes and works both sides of the plate. Katherine Piorkowski, Kellenberg, Sr. -- Ace for the defending three-time CHSAA state champs. Courtney Greene, East Islip, Soph. -- Hard throwing lefty with great off-speed pitches. Ashley Casazza and Sophie Dandola, Seaford -- Casazza, a junior headed to LIU Post, and Dandola, a sophomore who has made a verbal commitment to Hofstra, are a formidable duo in the circle. Elizabeth Campo, Oceanside, Jr. -- Control pitcher takes the ball for the preseason favorite in Nassau. Jessica Vadala and Geena Fornataro, New Hyde Park -- The two seniors provide a solid one-two punch in the circle. Ashley Melendez, Island Trees, Sr. -- Returning All-Long Island selection shifts to circle full time. Jamie Butalewicz, Sachem East, Sr. -- Has power and finesse, led team to county final last season. Krista Carcaterra, Massapequa, Sr. -- Enters with improved off-speed arsenal for the third-ranked Chiefs. Nicolette Moustouka, MacArthur, Sr. -- Moves the ball around the zone and hits her spots. Jenna Turato, Carey, Sr. -- Pinpoint control for the defending county champions. Catherine Vaughan, Hauppauge, Jr. -- All-Long Island outfielder takes over in the circle. Plus whoever ends up being named starting pitcher for East Meadow, the defending state champions. Victoria Overbeck, a sophomore pitcher at Plainview JFK. 20. Does anyone know a good fence company? Softball teams need fences. Pitchers get robbed when a ground ball rolls 300 feet and turns into a home run. Hitters get robbed when an outfielder catches a fly ball 300 feet from the plate and a home run turns into an out. And while we're at it, let's make the Long Island championships a best-of-three series.